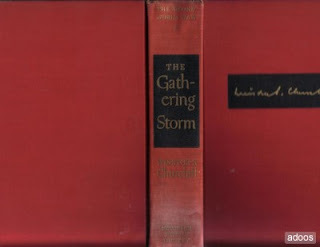 This post is Part II of my thoughts on The Gathering Storm , by Winston Churchill. You can read Part I by clicking on the link. By way of explanation, sometimes when works are more than 500 pages long I choose to "keep a diary" as I read instead of writing a conclusive book review at the end. I've done this with a few books, such as Jane Eyre and Wives & Daughters. Winston Churchill, being a bit verbose, "requires" a diary of me. DAY 5, 6 & 7: Read Chapters 15 - the end of Book I, then Chapters 1-3 of Book 2. Period covered: the fall of Czechoslovakia through the "The Ruin of Poland." * Chamberlain's unrealistic hopefulness that Hitler would form, if not friendly, at least peaceful relations with England. If we were vigilant against sin, and kept a tender heart turned towards God, we could win against sins. But we let them grow and fester until they demand more attention than we like to give. We find ourselves trapped and at war against the painful consequences of our own actions. If only we had been obedient to God's word in the first place and nipped sin in the bud. I think Winston paints a picture of unchecked sinful behaviors quite well, actually. I've been thinking over these words quite a bit. Day 8-9: Read Chapters 4 - the conclusion. Woah. I closed the book with a loud exhale. Would you believe me if I said this book was a real page turner for me? And that I was holding my breath while reading it, even though I knew how this portion of history would turn out? Well, I did and it's all true. From the "Twilight War" (with no one of great, great import being named Edward, thank you very much!) to Churchill being given the role of Prime Minster and being placed in charge of creating a national government, I was spell-bound. Spell-bound, in part, because of all of the parallels I see to the events leading up to World War II and issues in my own private life as well as issues in relation to others, and in relation to sin. Not to mention issues in relation to how the modern church at large has compromised vital points in the Gospel. So many applications could be made from Churchill's recitations to our own Christian walk that it's mind boggling. It would take "days, weeks, months, who knows?" to make even half of the spiritual applications that could be made. Would I recommend this read? Oh, you betcha! I love that! I love it when the day of compromise has ended and truth is seen for what it is and prevails. And oh, world, it will! Truth will prevail! * Churchill continues to do all in his power as First Lord of the Admiralty to prepare the country for what he believes is coming at the hands of Germany. He writes to the Prime Minister that the gas masks should be issued and that London's street lights should be fixed so that street wardens can have control of them. Churchill showed a lot of great wisdom and forethought which I really very much admire. He paid attention to details which could have been so easily overlooked. * Lastly (for purposes of this diary), Chamberlain resigned as Prime Minister and Churchill was appointed in his place. I really like this guy! I just do! Do I believe the history as he has laid out here? Yes, I do. He takes time, thought and gives attention to detail when laying out the chain of events leading up to World War II. He sticks to history as he knows it and when he wants to represent the mindset of another, he quotes from their letters or statements to explain why he (Churchill) thinks as he does. All in all, I find him to be trustworthy and reliable and I do very much admire him. And that just about wraps up The Gathering Storm for me! I think I'll take a breather before I proceed onto the second book in this series, Their Finest Hour . But I shall look forward to it also! I love your enthusiasm over this, Carrie! It makes md want to read it. In my B.C. life (before children), I taught world history and really enjoyed teaching this time period. It's funny that these aren't books that I would even THINK about reading.....until your posts. You ALMOST have me thinking I'd like to read these now, though. It never ceases to amaze me when reading any of Churchill's books, particularly this set, that he had both an incredibly broad and encompassing vision but also an exacting attention to detail. Have you watched the miniseries Winston Churchill: The Wilderness Years? And have I already recommended it to you? It really is very well acted and informative. Sherry, nope! Haven't. But I'll definitely have to look that up. I've seen The Gathering Storm and Into the Storm movies and enjoyed those both very much. But I haven't seen the mini series. Thanks for the tip!! You're killing me here!!! You're making me wish I had a lovely week to curl up with these books and just immerse myself into them. And my list for 2012 is already daunting. On a side note, you really MUST check out the biography of Bonhoeffer recently written by Metaxas. I have a feeling you would thoroughly enjoy it as well. Sounds like one I can't miss!